Op zaterdagavond 3 juni gaf vr Vasileios Thermos uit Athene oeen lezing in het Engels over verslavingen in de kathedraal van het Patriarchaat van Constantinopel te Rotterdam. Rev. Vasileios Thermos, M.D., Ph.D., was born in 1957 at Lefkada, Greece. He studied at the Medical School of Athens University and after he graduated he studied at the Theological School of the same University. He was specialized in Child and Adolescent Psychiatry which he still practices in Athens. In 1986 he was ordained and keeps serving at the diocese of Viotia. 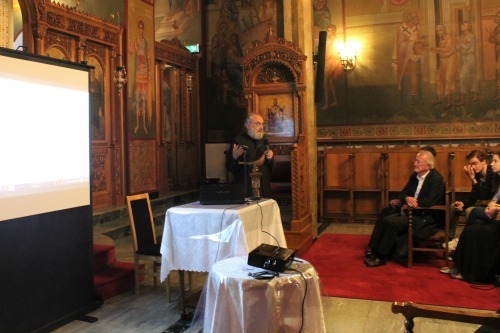 He has been engaged into training programs for clergy in Greece, Cyprus, USA. In 1996-97 he was a Visiting Scholar at Harvard Divinity School; he took classes also in Harvard School of Arts and Humanities, Boston College, Boston University, Andover Newton Theological School. In 1997 he received his PhD in Pastoral Psychology from the Theological School of Athens University. In 2014 he worked for 3 months as a Visiting Research Scholar at the Institute of Medical Humanities of the Medical School of Texas University on a project about homosexuality and contemporary gender theories. He has also conducted a research on clergy health and burnout. He has written numerous books and articles in Greek; some of them have been translated into English, French, Russian, Romanian, Bulgarian, Spanish. He is the editor of a new journal in Greek (Psyches dromoi: Ways of the Soul), published every 6 months, on the relationships between theology/religion and psychiatry/psychology (first issue in May 2011). In 2004 a master thesis on his total work appeared by Peter Kazaku at the Theological School of Balamand University, Lebanon. This thesis was updated and enriched, thus forming the book «Orthodoxy and Psychoanalysis: Dirge or Polychronion to the Centuries-old Tradition?», which was published in 2013 by Peter Lang publications in the series ‘European University Studies’, volume 938. During 2001-2013 he was a Visiting Professor of Pastoral Psychology and Psychology of Religion in the Theological Academy of the Orthodox Church of Albania. Since 2013 he teaches as an Assistant Professor of Pastoral Theology and Pastoral Psychology in the University Ecclesiastical Academy of Athens. He has been a member of scientific committees organizing conferences on the relationship between theology and psychiatry/psychology. He has also given thousands of lectures to seminars, parents groups, clergy assemblies, camps, high schools, radio and TV etc.